This week I have felt like my heart might break each time I met one of the newest members of our GSF family. Two siblings were recently taken in who are so malnourished and sad looking. Their limbs are the size of a few of my fingers, no baby fat, no healthy chubby checks, just a withdrawn hungry look and bony limbs. I first met the older sibling and just went home praying. I was glad to see this precious little one eating, a carrot in each hand. The younger brother is also very thin. Just a couple days later, I heard that a 3 year old was coming. I saw him being carried to the babies' home. A 3 year old should be walking to the toddler house, so I knew he was in bad shape. He weighs about 15 pounds as a 3 year old and is so terribly skinny, but he is a sweet and cheerful little boy. I went to the babies' house to hold him, and he felt like a bunch of bones. It just breaks my heart. I hugged him and held him and prayed for him. 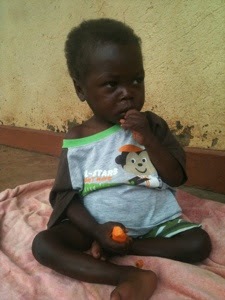 Here is a photo of this precious boy taken by Corinne Iya, our sponsorship coordinator. While I was at the baby house I saw Timothy, a boy who came to GSF very malnurished back in December. He is not yet fat, but he is looking much healthier, walking around, playing, smiling, and eating. Later in the day I saw Alex. When he came to GSF I thought he might not live. Now I see him running around, laughing, playing, and acting like a normal healthy toddler. God has brought healing to so many children through the the ministry of Good Shepherd's Fold, both physically and spiritually. When I see these children come here, I grieve about the months and sometimes even years that they have gone hungry, but I also want to rejoice. God has brought them here to bring them out of these sad situations. They will now have food to eat. They will be held, loved, prayed over, and taught. There is hope. Please pray for these 3 precious children whose bodies are so weak right now. And celebrate with me, the many happy stories of what God has done and continues to do here at GSF. As I was looking for a verse about God's care for the weak I was reminded of several things. God tells his people over and over again to care for the weak, the fatherless, the widow, the stranger in their land. God often does this in the context of reminding us, his people, that we are weak. We were strangers. We were without hope. But God has shown us mercy and compassion by sending Jesus, his own Son, to rescue us. He is a gracious and compassionate God! He cares for the weak and broken, me and you and these children. Jesus came for those who know they are sick, not those who think they have it all together. We are just like these desperate, starving, sick children, and God has had compassion on us. On Sunday as we were worshiping in our village church, I saw what a broken people we are in physical ways as a picture of our spiritual brokenness and need. As we were singing, my tongue was bothering me. I am physically broken. A precious young lady with special needs was behind me singing as best she could. The congregation was full of orphans and widows. We are often led by a man with such severe effects from polio that he could not walk for 17 years. The tarp over our thatched roof is full of holes and the rainy season is now here. We all are in desperate need. We are weak and dependent upon The Lord. Although our church in a small village in Uganda looks very different than many of your congregations, we are all needy. Your brokenness may be more spiritual in a struggle with a particular sin. It may be in a particular relationship or an emotional struggle. But just because your church has a roof and a clean floor and everyone looks and smells good, do not be fooled. You and the people around you all need compassion. And we have a gracious and compassionate God! He gives us the privilege of showing that compassion to the people around us. Look to see where he might be calling you to be his hands and feet. Lately I have been very aware of my weaknesses in many ways. Physically, my tongue still causes me pain and sometimes trouble speaking clearly. I am awake writing this post at 3am because I cannot sleep due to the neck and back pain I have been having. Spiritually I have seen my weakness in my selfishness and impatience with my family. I have been struggling emotionally with discouragement about all of the above. But thankfully, a few people have recently reminded me of 2 Corinthians 12:9&10. Paul was asking the Lord to remove the "thorn in his flesh." "But (the Lord) said to me, 'My grace is sufficient for you, for my power is made perfect in weakness.' Therefore I will boast all the more gladly of my weaknesses, so that the power of Christ may rest upon me. For the sake of Christ, then, I am content with weaknesses, insults, hardships, persecutions, and calamities. For when I am weak, then I am strong." I am thankful that God has compassion toward the weak, toward people like me, you, and these children. Please pray for these three newest children, Bahati, Arthur and John. 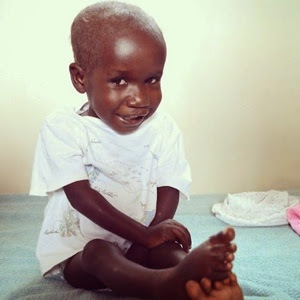 Bahati is the one who is the most sick right now. The name Bahati means "blessing." What a blessing it is to see God's power and grace in the midst of weakness! His grace is sufficient.